KANSAS CITY, Mo. 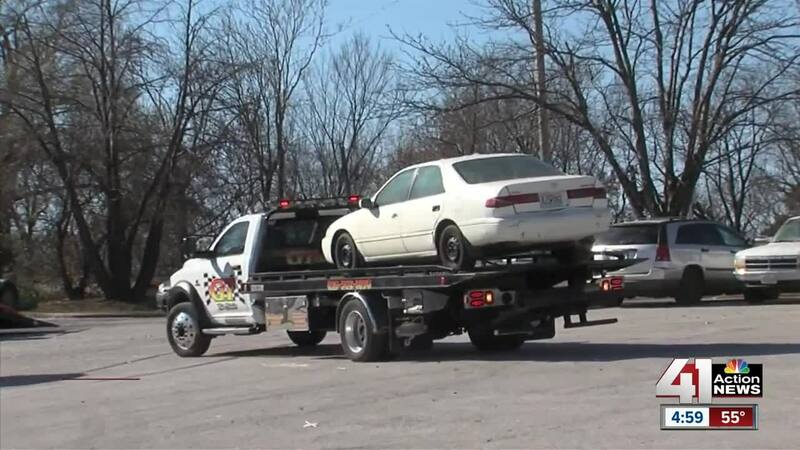 — Tow trucks flooded the northeast Kansas City neighborhood Friday on a mission to remove abandoned cars from the streets. Earlier this week, Kansas City Police Department parking control officers tagged and chalked 257 vehicles. According to city law, cars can't be parked in the same spot for two straight days. So those that were tagged but not moved by Friday were hauled away. The cars were taken to one of two makeshift lots before reaching the city impound lot on Front Street. KCPD parking control supervisor Rita Garcia oversaw the massive operation from south of the Missouri River to 31st Street and from Prospect to Topping avenues. "Most of those people wanted to know what it was about and that they were glad to move them. Some of them, not so much," Garcia said. The sweep was the first-of-its-kind in a decade. The parking control unit said it conducted the sweep now because it has the resources. In all, 20 officers from east patrol and the traffic enforcement unit assisted parking control officers, with more than a dozen tow trucks making the rounds. In the process, police recovered three stolen cars. "There are people in this neighborhood that care a lot about this neighborhood, so we're trying to not necessarily hurt people, we're trying to clean up so people can have a happier life to live," Garcia said. By the end of the day, 54 vehicles were towed, according to Garcia. Fifty of those were abandoned and the other four were parked illegally. Police also issued 106 citations.